My Rose Valley: Semla - make your own! Semla - make your own! The name 'semla' comes from the Spanish word "simila", the finest white flour you can fine. In the old days it was really hard to find white flour to bake with and this bun was a very special treat. Catholics called it "the fasting bun", and it served its name from being one of many highlights at the food feast the days before the 40 day long fasting period that ended in Easter... (Pweuh! I could NEVER do that!). 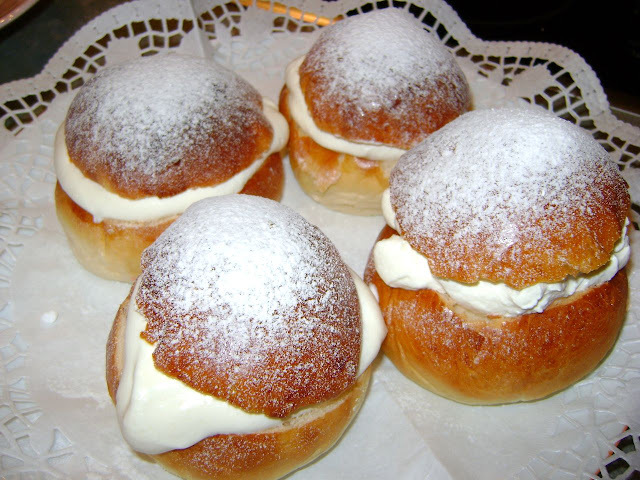 This feast gave the names to the three big "semla" days Fasting Feast Sunday, Big Bun Monday and Fat Tuesday, the last one most recognized by us Swedes I am sure. The names themselves makes me want to eat even more!!! And yes, these are direct translations and therefor the names are kind of funny, just like they should be. 1. Melt butter and mix with milk, heat up until finger warm. 2. Pour half the liquid into a big baking bowl, crumble fresh yeast into the liquid and stir until disolved. Add the rest of the liquid. 3. Add sugar, salt and egg. Stir in flour until dough lets go of the bowl (a little at the time). Kneed on table with a little more flour until smooth (just for a few minuted) and make sure not to make the dough to dry. Put it back in the bowl to rise underneth a towel in a non-drafty spot for about 30-40 minutes until double size. 4. No more flour. Kneed dough a few minutes until smooth. Cut into handful pieces, roll into balls. Place balls on buttered (or wax paper dressed) oven trays, leave to rise again for 30 minutes under a towel. 5. Bake in 225˚C/380˚F for 6-12 minutes. Leave to cool. 6. When cool, cut off the tip of the top as a hat. Pick out the crumble from inside the bun to make a hole (not to close to the edges). 7. Mix bread crumbs with almondpaste and cream, the mixture should be quite creamy and loose. Scoop the mixture into the hole in the buns. Cover with whipped cream, add the bread top on top. Sprinkle with icing sugar. Voila! Enjoy! Du är kul du! Och very hot pssst! !